To provide nutritious food and support services to people in need with compassion, dignity and respect. Creating pathways from scarcity to security. For more than forty years Nourish (formerly FISH Food Banks) has provided a lifeline of support to its clients. In the early 1970’s, a group of Pierce County churches came together to form what would evolve into seven brick-and-mortar locations, as well as ten additional sites served by a ground-breaking mobile unit, one of only a few of its kind in the country. Nourish reaches more people successfully due to its size, the largest network of food banks in Pierce County. From early on, Nourish collaborated with other local organizations. Both to serve those struggling with hunger in the community and also to change the entire food security infrastructure in Pierce County by creating a “food bank for food banks” now known as Emergency Food Network. This innovative thinking allowed Nourish to better meet the needs of its clients. In 2009, Nourish again responded to the hunger crisis in Pierce County by creating a broader support network of community resources available to its clients to strategically address the complex causal factors related to food insecurity, including mental illness, employment, and housing. Then, in 2011, Nourish pursued the novel idea of establishing the first mobile food bank in Pierce County, able to nourish parts of the county that would otherwise have no access to a traditional food bank. In 2014, we were named “Non-Profit of the year” by the Tacoma-Pierce County Chamber of Commerce. And finally, in 2017, FISH Food Banks rebranded as Nourish, with a new name and logo meant to embody the dynamic relationship between donors, volunteers, and staff, living out Nourish’s mission of caring for people with respect, dignity and compassion. After visiting a Nourish Food Bank, Debbie shares her story of going through a challenging time and the difference that she experienced for her and her family after visiting Nourish. “This is a godsend. What we get here lets us know that we are going to have enough food to last a week or so.” She is just one of 9,000 households to depend on Nourish each month. The mission of Nourish is to provide nutritious food and support services to people in need with compassion, dignity and respect. Debbie’s experience reflects the aim of Nourish beautifully, “It’s a nice community. We always talk and when somebody’s not here we worry about them or try to find out what’s happening and if we can help.” It’s more than just giving people food. It’s valuing their humanity.” Nourish lives out this mission by allowing each one of the 60,000+ people served in 2017 to shop for his or her own food with dignity. Each food bank is set up like a grocery store, lined with pasta and fresh produce. The staff and volunteers show respect for a client’s privacy by not asking too many invasive questions. And people experience compassion by knowing that no one will be turned away hungry. That value flows into Nourish’s vision of – creating security from scarcity. And it provides a framework for our programs. Nourish emphasizes nutritious food and helping clients to learn how to cook healthy meals, so that people are empowered to make healthy choices, regardless of whether they continue to receive their food from a food bank. Nourish also helps clients move to a more stable future by providing information on housing, medical support, government subsidies, and community resources. Residents of Pierce County can visit one of the many Nourish food banks and walk away with food to feed their families and an opportunity for a better life. On May 19, 2017 FISH Food Banks of Pierce County changed its name to Nourish Pierce County, a name reflecting the organization’s mission and how donors, volunteers and staff work together to serve anyone who needs food. A new logo was unveiled and the organization revealed plans to continue to grow and serve local residents. FISH Food Banks served 518,000 individuals facing significant hardships. Since 2008, the community’s need for food distribution through FISH has increased a staggering 132%. FISH Food Banks launches the Mobile Food Bank, (owned by FISH and operated in partnership with Emergency Food Network) is designed to reach areas of the county with high need but no food bank access. It is Pierce County’s first completely self-contained mobile food bank and one of only a few in the country. Recognizing that many food bank clients need more than food, FISH Food Banks becomes the first food bank organization in the county to offer extended services through a “Connection Center” partnership with South Sound Outreach Services (SSO). 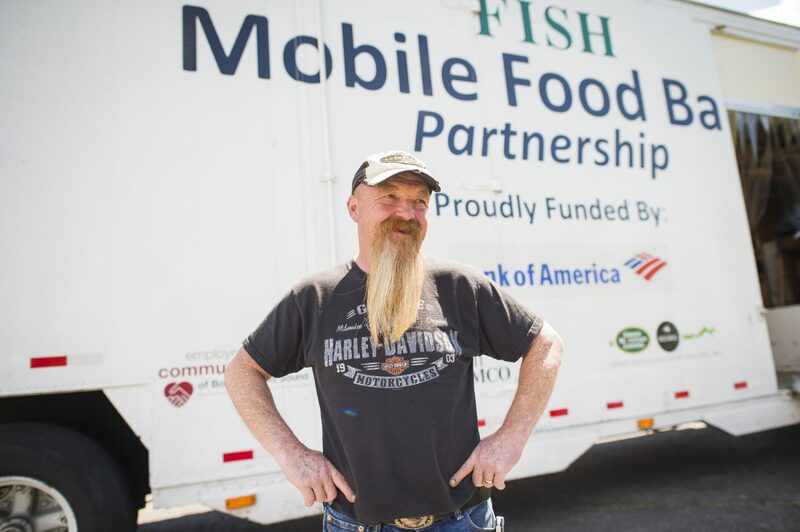 By making an SSO outreach specialist available onsite in the larger food banks, FISH offers clients a single point of access for dozens of community resources, government subsidies, medical and housing options. Southeast FISH expands to add additional space. Edgewood Community FISH moves into new quarters at the Edgewood Community Center on the campus of Mountain View Lutheran Church. FISH adds food banks in Roy and Graham for a total of eleven sites. There are also 25 affiliated food bank locations, more than 600 volunteers, and two full-time paid staff. FISH incorporates as FISH Food Banks of Pierce County, including all the Pierce County FISH groups and receives nonprofit 501c3 status in May 1983. FISH Food Banks partners with The Salvation Army and the Tacoma Rescue Mission to form the Emergency Food Network (EFN). FISH Administrative Office moves to Associated Ministries; director becomes full-time. Working relationship between FISH Food Banks and Associated Ministries is formalized with a signed covenant agreement. Northwest Tacoma FISH begins operations. Lakes Area FISH also begins, operated by Christ Lutheran Church and Little Church on the Prairie..
Associated Ministries begins coordinating Food First Food Banks, while southeast Tacoma FISH begins operations at Lutheran Church of Christ the King.